With forecasts of up to 90mph winds I wasn’t too hopeful of filling vacated places on this meet when they inevitably started becoming free in the couple of days before, so I was surprised to receive an immediate response from Kate taking up the first free spot. Thoroughly impressed by her enthusiasm, it turned out to be a small oversight and she hadn’t actually looked at the forecast before taking up a spot. Despite the drop outs we still managed an oversubscribed meet with Alan H managing to secure his own room. 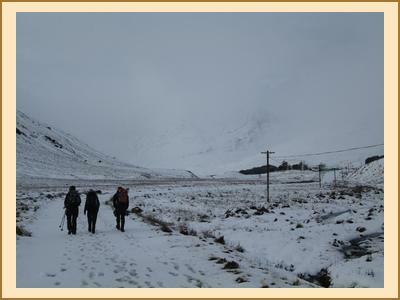 Saturday arrived and it seemed that the bad weather did not dampen spirits – by the time I emerged at 9.00 assuming everyone would be taking a long lie in the bunkhouse was mostly empty. My second cup of tea about 9.15 saw the first returns! Alan S, Alan H and Kate arrived back having made a hasty retreat from a trip up to attempt a graham near Bridge of Orchy that apparently saw Alan H’s car door nearly removed when Kate opened it to get out. It could not have been a more timely retreat as I was about to commit to a run with Alan R, Claire and Antti up the West Highland Way – with my poor packing on basis had been warm winter so far (shorts) Anne was kindly going to act as a half way rescue party if needed by taking the car to meet us at Bridge of Orchy hotel. 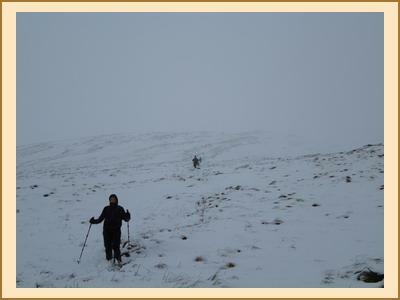 Anne and I quickly changed plans and joined their soon formulated Plan B – a trip up Meall Odhar. We followed in the footsteps of Mike and Fiona who had set off earlier targeting the same Graham. They were lucky enough to make the summit having set off about an hour before. Our party got within about 150m before giving up at the point we would have had to start crawling on all fours through the increasing wind. To the west of us Tim and Kenny successfully got to the top of Beinn Chuirn having also been lucky enough to hit a small break in the weather just near the top. Gather it was a quick touch of the summit cairn before a very rapid descent when they looked towards the black mass of clouds approaching. Alan, Claire and Antti set off on their run. They weren’t the only ones on the West Highland way as earlier Alison, Ken, Emma, Pauline and Dave had set off in the same direction for lunch at the hotel. Understand there was an enjoyable refuelling stop in front of an open fire in the hotel - whilst Claire and Antti munched a small scone Alan R downed a pint of ale before the 6 mile run back – perhaps secret to his running successes? Saturday night and Clare A managed to beat her own long standing lateness record arriving with Monty a full 24 hours late, both looking thoroughly refreshed (?) after a run on the way up. By Sunday, it was, for the first time this winter, looking like a proper winter meet. As even leaving the car park first thing looked to be a challenge most people opted for plans close to the hostel. Tim took the opportunity to give the cross country skies an airing. Alison, Allan, Kate, Ken, Alan, Anne headed up Beinn Chuirn, meanwhile Clare, Monty, Pauline, Dave and I went up the nearby Ben Oss and Beinn Dubhcraig. With no visibility above 500m, the day was mostly a good exercise in winter navigation but was good to manage to get up a hill. When we left the hut Fiona and Mike were still negotiating with the ever optimistic Kenny, who was declaring every option floated for the day unappealing. Fiona and Mike ended up doing Meall Glas and Sgiath Chuil plus the two Munro tops in between, seeing not a lot either and making good use of the snow shoes. Kenny eventually made his own Graham based plans for the day (there were rumours of stopping and starting and some cursing during the 7 hour day). Alan H also opted for a Graham heading up Beinn Leabhainn and breaking trail all day but at least in sunshine until about 50m from the top when engulfed in cloud. Claire and Antti who, after managing an early exit from the car park using snow socks, made a long journey round to Beinn Bhuidhe keeping fingers crossed on the pass. Reportedly a “steep and soggy/snowy ascent” once they’d completed the 7km walk in but day much eased by a stop at the loch fine brewery on the way home.